The existing menu of modern tapas at Salt Tapas & Bar has been revived with the arrival of Executive Chef Ronald Li. Formerly from KU DÉ TA (now CÉ LA VI), Chef Ronald has created a menu celebrating hearty, slow-cooked fare. More impressive is that although this is essentially still a “bar”, he pays close attention to presentation – every plate arrives on the table looking beautiful and artistic. Menu highlights include the grilled eryngii mushrooms on a bed of chive aioli which I love. There’s minimal seasoning so the natural sweetness of the juicy mushrooms shines through. Even though the menu has supposedly an “Australian twist”, I find that there’s a bit of Middle Eastern influences too – curried roast pumpkin with labneh and dukkah; golden and red beets with ricotta and fresh figs; haloumi paired with eggplant and chickpea. All three were very tasty and I can see myself coming back for more! Out of the new “mains to share” section, the “fish to share” features a 400g slab of grilled barramundi. Accompanied by tangy mango salsa and sautéed broccolini, the moist and delicate fish is simply grilled with a dash of yuzu to highlight its natural delicate flavor. I heard another noteworthy main to share is the paella with lashings of creamy saffron rouille but I gave that a miss since I’m not keen on carb-heavy rice dishes. If there’s only one dessert I can have, it’s definitely going to be the gooey chocolate tart crowned with a scoop of mango sorbet. I can never resist dark chocolate – especially when thin buttery crust and non-icy sorbet are part of the deal. And be warned, get the dulce de leche semifreddo only if you have an extreme sweet tooth! Thank you, Ada, for hosting dinner! “Cooking With Friends” is back at Osia! This time, Celebrity Chef Scott Webster has invited Executive Chef Andrew Turner from Hotel Café Royal in London as the guest chef. Together, the dynamic duo has designed a menu consisting of Osia’s signatures and Chef Turner’s specially created dishes for his stint here. Reinterpreting traditional flavours with a contemporary spin, some of his key dishes are the appetizer of pea and mint veloute and main of black angus beef. The former is paired with comte cheese to create a smooth creamy base for the thyme ravioli while cutting through the brininess of the addictive anchovy flute; whereas the latter is given an Asian twist through the accompanying bok choy and sweet and sour Hong Kong sauce – quoting our waiter: “a Chinese-ish dish done by an English chef”! 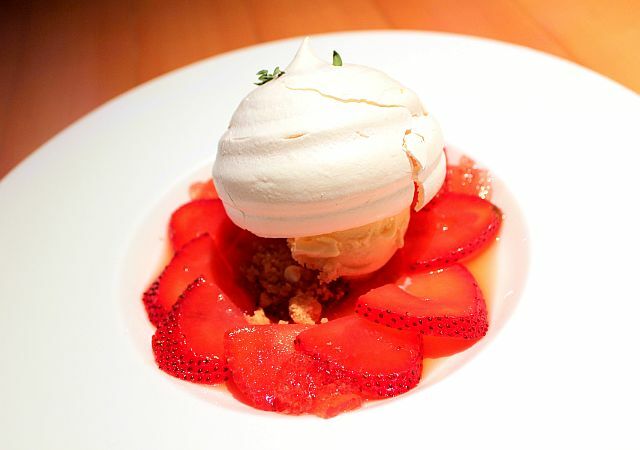 The dessert of “neaten” mess is his take on the classic English dessert, Eton mess. I thought it was smart to add a scoop of tangy lemon ice cream, otherwise the mixture of strawberries and meringue would be too sweet. As for Osia’s, I already did a write-up earlier this year and was happy for the chance to refresh my memory of some of the dishes – still loving the freshly baked flat bread and soft-textured shiromiso perch! Not so much the grilled octopus this time as they were too chewy, giving my jaws a good (and unnecessary) workout! The “Cooking With Friends” menu ends this Saturday, 16 May. My thanks to Lavinia for hosting dinner! I was hoping to try the Valentine’s Day menu at Osia but an unexpected series of events (being melodrama here, haha) led to us having a go at its a la carte menu instead. Oh, what a great blessing in disguise! I instagram-ed this immediately quoting K that this is “the best bread of 2015!” and three days later, he’s still swooning over how warm, soft and chewy the freshly baked bread was! Macadamia pesto was the obvious favourite for us and the tube of smoked eggplant spread was so cute and handy that I almost wanted to bring it home! The generous chunk of confit trout probably won’t be winning any creativity contest but a simple dish done well still deserves credit! Honestly, I wouldn’t mind not sharing this with K haha. Oh man, lobster and butter? I love this dish, of course. Sheet pasta was silky smooth and the meaty lobster was lusciously firm and mildly sweet. That said, I thought the fermented black bean was out of place and didn’t add any value taste- or presentation-wise. By the third starter, I’m starting to get a sense that Chef de Cuisine Douglas Tay likes to pair seafood with fruits in his style of modern Australia-Asian cooking. Trout with pineapple, lobster with mango, octopus with apple – refreshing is their common denominator, I like! Grilled to a T (i.e. medium rare), the black angus might look very manly but it was actually a pretty girly pink on the inside! If you can’t imagine life without meat, this one is for you. We had different views about the accompaniments – I thought the bed of tomato parmesan was way too cheesy but K liked it that way; he didn’t fancy the greenish basil cèpe and I gladly spooned that onto my plate, score! I remember being impressed by the shiromiso Chilean seabass back in 2010 and I still feel the same now. Perch was delicate yet rich in flavour, especially when smothered with the sweet shiromiso glaze on the side. Wickedly delicious! I dissed the hot chocolate soup five years ago and I’m not changing my opinion. Although very decadent, it’s “just high quality molten chocolate” (quoting myself ha). The macadamia souffle requires 35 minutes of cooking time so please order asap! Ours puffed to a perfect height when it was fetched out from the oven and was piping hot when we dug in eagerly. Golden-brown crust, moist and creamy inside with bits of nuts scattered throughout, this was definitely the highlight of our meal! Our last dessert was the most special! I think of it as a sort of coconut marshmallow creme brulee – torched to a crisp, googy in the middle, and a crunchy base of crumbs at the bottom. Least photogenic perhaps, but a winner nevertheless! On this Valentine’s Day, wine and dine with the special someone at Osia where you can tuck into either the 4 ($135++) or 5-course ($160++) Valentine’s Day Menu where much of the produce used comes fresh from Australia. Among the standout dishes include the luxurious Foie Gras with Black Truffle and Madagascar Vanilla which is given a tangy lift with the accompanying Green Apple Espuma and the Pan Fried Perch with Duck Fat Charlotte Potato, Bacon Cream, Taggiasca Olive Tapenade and Basil Foam. Patrons seeking an aphrodasaic on the evening of romance can look out for the Gillardeau with Spinach Porridge and Salicornia. My thanks to Lavinia for arranging dinner! Our bosses decided to take us out for lunch a couple of days ago and as usual, the resident food blogger was tasked to recommend a place that can accommodate eight hungry folks. Common Man Coffee Roasters was shortlisted and it turned out to be a great choice (self-praise haha) as several ladies in the office have been wanting to try this hippy cafe! I felt really happy (it’s a foodie thing; I like to see people well-fed and satisfied) that everyone seemed so pleased with their selections, from the turkish/full breakfast to grilled “chilli” chicken with crushed avocado salsa. My crab salad was outstanding too, a lovely plate of fresh white meat tossed with pomegranate and caper crumbs in a yuzu mango mint dressing on a bed of wild rocket, romaine and endive. My idea of a healthy yet hearty lunch. Boring as it may be, salmon was my choice of main, especially when nicely seared crispy skin, quinoa and fennel were part of the deal! A complete healthy meal in itself, really. K went for the meaty heavyweights – 250g of ribeye steak (photo on Instagram) and wagyu burger, both proved to be satisfactory if not particularly memorable. So… To sum up what we think of South Coast in one word: decent. Half an hour wait later, we were in for a late brunch at The Lokal yesterday. “Pimp My Breakfast”, i.e. DIY from the list of breakfast sides, can become pricey when we want to choose every single item on the menu haha. But $4.50 for two modest slices of sourdough and one buck for butter?! Daylight robbery!! Or rather, inflation ouch. Anyway, scrambled eggs and sausage were average but the crispy bacon blew K away. Now, in the years we have been brunching together, K has never ever liked crispy bacon so I was already waiting for him to diss it when he surprised me with a heartfelt “OMG it’s soooo good!” haha. Yes, top marks for the cool nitrate-free cured in-house crispy bacon! One or two misgivings aside, we will be back soon! For avocado, bacon, salad and salmon, cheers.